Mystical Space Typhoon is another card we’ve profiled on CoTD, and remains a great card to use. 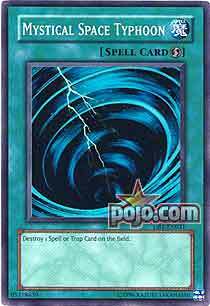 Available to any deck wanting to use it, MST destroys a Spell/Trap card. As a Quick-Play it can be used either turn and almost whenever you’d like. An End Phase MST used to be the bane of a player’s existence. With Twin Twister present in the game now, players can debate which is better. You can topdeck MST and use it right away, while you need a card in hand for Twin Twister. However, Twin Twister destroys up to 2, while MST always destroys 1. A great amount of decks still play MST alongside Twin Twister, as Spell/Trap destruction is always desired. With Pendulums potentially on the downswing, and Field Spells heavily on the rise, why not use both? We end this week off with the biggest example of powercreep in the game today, Mystical Space Typhoon. MST is a Quick-Play Spell that allows you to destroy a Spell/Trap on the field. When it first came out, it was very powerful to take out any defense or prevent your opponent from mounting offense with powerful Equip Spells. It was even Limited at one stage. Now in 2017, there are so many Spell/Trap removal cards, of course they were going to print something better than MST. Cosmic Cyclone, Heavy Storm Duster, and Twin Twisters come to mind. And don’t get me started on if Heavy Storm and/or Harpie Feather Duster makes its return to the game. The card could of got a 4.5/5 if it wasn’t for all the Spell/Trap removal printed, now the score is lowered a fair amount. Not too much because the card is still good and has its place in the game, just powercreeped for now, but the right broken Spell/Trap printed (though it would need to be very specific to where MST is favorable on it over Cosmic Cyclone) could maybe make this more favorable over Cosmic Cyclone and certain decks don’t want to use Twin Twisters, so yeah. Alex Searcy Mystical Space Typhoon closes the week. God, how many cards in this family alone are there now that do things similar to this in different varieties? This card has been reviewed like six times I think I counted, but not for six years. It’s been up and down the Ban list, Heavy Storm and Harpie’s Feather Duster are Banned, but you’ve got three of this little Quickplay if necessary. A long with Twister, Twin Twister, there’s just so many options. This is a good 1-for-1, and powerful, and an original. I know others like some of the other cards available better these days, but this card always holds a special place in my heart.